The quintet started back in 2014 and about a year Frontiers Records showed interest in them. 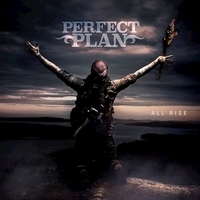 And with All Rise Perfect Plan are now trying to conquer the hearts of melodic rock fans. Quite heavy the Swedish kick off with Bad City Woman, a track which has an 80's feel but doesn't sound backdated! They mix 80's hard rock with the Scandinavian melodic metal of the same era. Think Treat meets Whitesnake meets Ratt. And add a dash of Trixter. Leif Ehlin's keyboard opens up In And Out Of Love, but it's the rhythm section whole delivers the perfect playground for guitarist Rolf Nordström and singer Kent Hilli. Singer Kent Hilli is the strong point of Perfect Plan - powerful and emotional. Heavy riffs lead into Stone Cold Lover and make me think of Bon Jovi (Slippery When Wet era) just to turn into a heavy version of Journey. At Gone Too Far the Hammond sound is taking you back to the early days of Whitesnake. Once again it's Kent Hilli's voice which turns a good tune into a great one. Another of my faves is Can't Turn Back, I want to sing along right away. Actually I get this urge to sing along at almost every track. This is right up my alley, so if you like the mentioned bands, you should give this album a chance! For me this is, so far, the soundtrack for my summer 2018! Not very unique, but It's pure fun!